vegan chocolate chip oatmeal cookies!!!! Love this wheat-free vegan oatmeal chocolate chip cookie recipe from Laura Theodore, aka The Jazzy Vegetarian, with only FOUR ingredients! And if you use gluten-free oats, this vegan cookie recipe is gluten-free too! It’s from her new book Vegan-Ease, where all of the recipes are vegan and all are ranked with an “ease factor.” This yummy vegan cookie recipe is so quick and easy to make, it’s got an ease factor of 1. 1. Preheat the oven 375 degrees F. Line a large baking sheet with unbleached parchment paper. 2. Put the bananas in a medium-sized bowl and mash with a potato masher or large fork until smooth. Add the oats, raisins and chocolate chips; stir to combine. 3. Using a cookie scoop or large spoon, drop a heaping tablespoonful of the cookie batter onto the lined baking sheet, gently flattening it with a rubber spatula or clean fingertips. Continue in this manner with the remaining cookie dough. 4. Bake for 13 to 17 minutes, or until the edges are golden brown and cookies are almost set. Transfer the cookies to a wire rack and let cool for 10 minutes. Stored in an airtight container in the refrigerator, cookies will keep for about 3 days. 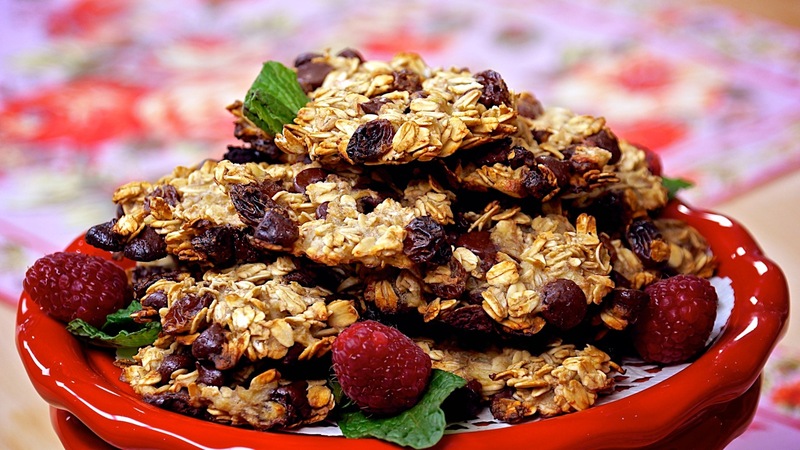 Let us know what you think of this easy vegan recipe: Chocolate Chip Oatmeal Cookies!